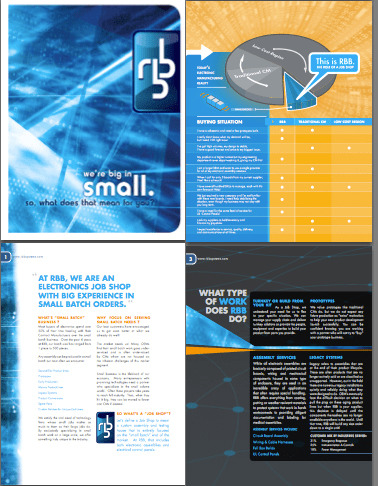 Since working in Market Development at RBB, I have been a part of implementing our company's digital marketing plans. Through these online efforts we manage leads, connect with prospects, and develop relationships, while also nurturing and interacting with current customers. All of this is by way of website offers, blog interaction, Facebook updates, tweeting, creating YouTube videos and participating in LinkedIn conversations. Pretty crazy! As I've blogged about before, I feel very strongly about the benefits of establishing a digital marketing plan... but what about traditional marketing efforts? If our small batch electronic assemblies company has a strong digital marketing plan in place and have been seeing excellent results, isn’t that enough? In short, "no.” Nothing can replace an in-person company tour with its chance to show quality materials, equipment and friendly, knowledgeable faces. Branded literature and slideshows are useful at networking events. Press releases are a great way to reach a variety of outlets to update the community on company news. Quality customer service itself often results in repeat business, highly valued referrals and word-of-mouth marketing. As an electronic manufacturer always looking to stay up to date and educated, meet new people, serve many different industries, all three of these still have merit for RBB. Attending every single trade show out there is obviously not the route to go to ensure time and money is not wasted. We only attend shows that have a need for our small batch electronic assemblies, ones hosted by organizations we belong to like the SMTA Expo (Surface Mount Technology Association) and shows that support and serve our customer base, such as the FDIC (Fire Department Instructor Conference). 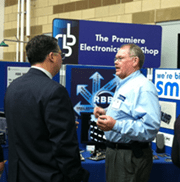 With a great trade show right around the corner (April 16-18th) I reached out to RBB's Sales Manager, Kurt Schaefer and Project Specialist, Ross Lilley regarding their attendance at the BioMEMS 2013 Conference at Lorain County Community College. Support local electronics technology initiatives. At RBB, we focus on a niche; one serving a variety of different industries: industrial, commercial, food services, medical and military sectors. Our marketing mix is just as diverse as the companies and industries we serve, yet also, and most importantly, focused on our niche: embracing small batch electronic assemblies. What does your electronics manufacturing marketing mix look like? Are trade shows a part of it? Will we see you at any upcoming trade shows? Let us know on our Facebook page, or tweet us! We hope to see you there! Kara Hendrick serves as Market Development at RBB Systems. She also runs the company Modern Marketing Promotions which helps develop and manage online marketing campaigns for businesses; driving brand awareness, engagement and traffic to social media pages and company websites.